Park (Cottage Grove) coach Jay Moser, left, and Woodbury coach Wes Bolin, right, have helped raise more than $7,000 over the last three years for the Coaches Helping Eliminate Cancer in Kids program. The rivalry between Woodbury and Park (Cottage Grove) typically doesn’t grab statewide attention like some of the Minnesota’s more famous annual blood-boiling, tempers-flaring showdowns. Lately, though, a new layer of competition has been added to each season’s second meeting between the west metro neighbors, making it one of the more, uhhhh, unique games in the state. Really, unique doesn’t begin to describe a game that, for the last three years, has begun with Park coach Jay Moser tugging a Woodbury jersey over his shoulders before taking his place behind the Wolfpack bench. For the last three years, the schools have gone head to head off the ice in a challenge to see who can raise the most money for the Coaches Helping Eliminate Cancer in Kids program. The schools have raised more than $7,000 the last three years. 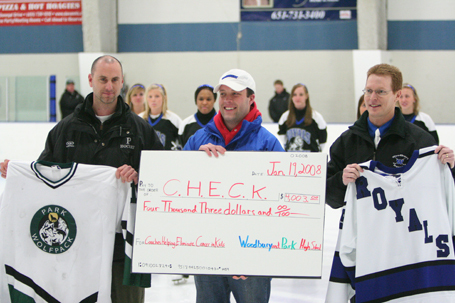 The teams play on Saturday, Feb. 5, at Bielenberg Ice Arena in Woodbury. Before the game, it will be announced which school raised the most money. And which coach will wear the opposition’s colors. CHECK was founded by Ty and Erika Eigner. Their son, Peter, was diagnosed with cancer when he was 4 years old. Ty Eigner was the head coach at Brainerd and an assistant coach at Eden Prairie before taking an assistant coaching job at Bowling Green this season. Eigner and Bolin formed their friendship during the summers while working as coaches at the Minnesota Hockey Camps in the Brainerd area. Peter Eigner is 8 now. He plays hockey, baseball, soccer and flag football, among other sports. Eigner said he hopes to someday get college coaches involved in CHECK while still receiving the support of Minnesota’s high school coaches. “We’re thrilled that people back in Minnesota like Wes and Jay are still doing what they are doing,” he said.